Ambient Weather, in coordination with the Consumer Safety Product Commission (CPSC), is conducting a voluntary recall of the WR-333 and WR-334 Weather Radios, and providing a refund based on the purchase price. Fill out the form below. If you are unable to fill out this form, please call us toll-free at 877-413-8800 Monday through Friday between 8 a.m. and 3 p.m. MT. You will receive an email confirmation with a UPS return shipping label within 10 business days (two weeks). Please make a note of the UPS Tracking Number. Drop off the package at any facility where UPS picks up. Please allow 4-6 weeks for your refund check to arrive. The WR-333 and WR-334 radios are red and black and measure about 8 inches wide by 4 inches tall by 2 inches deep. �Ambient Weather,� �AM/FM/Weather Band Radio� and �NOAA Weather Radio� are printed in white lettering on the front of the radio. 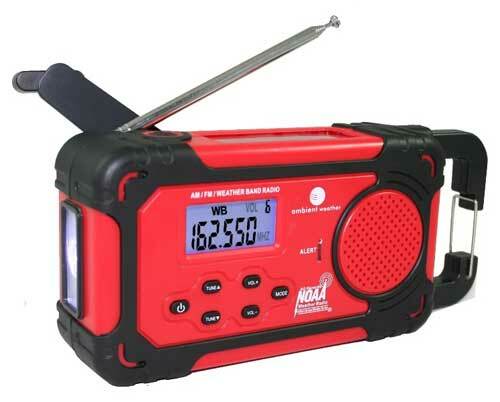 The radios have a black crank handle on the back, an antenna on the top, a single LED flashlight on the left side, a clip on the right side and a cable to charge a smart phone. Model number WR-333 or WR-334 is printed in the owner�s manual.